The subtitle of Gregory Rodriquez’s new book—Mexican Immigration and the Future of Race in America—reflects both the work’s strengths and weaknesses. As an analysis of the history of Mexican immigration to the United States from the 19th Century through the 1990’s, the book may be unsurpassed in its clarity and insights. But as an account of the future of racial identity in the United States, the work falls short by curiously ignoring the dramatic developments around Mexican-American identity that have occurred since 2000. 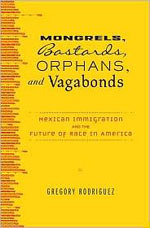 The rise of the immigrants’ rights movement, and the resulting backlash, are not discussed in the book. These developments impact Rodriguez’s claim that Latinos are more impacted by class than racial concerns, and that the immigration issue is “losing its ethnic overtones.” But Rodriquez’s assertion that Latinos are not a monolith, and that Mexican-Americans are redefining racial identity in the United States while favoring assimilation far more than their advocates and opponents suggest, are but a few of the critical points that make Mongrels, Bastards, Orphans and Vagabonds a thought-provoking read. Los Angeles Times columnist Gregory Rodriquez has written a book that is equally perceptive and perplexing. Had this book been published in the late 1990’s, it would have represented a major contribution to our understanding of Mexican-Americans. But Rodriquez’s historical account of Mexican immigration to the United States relies extensively on studies from the 1980’s and early 1990’s, with the significant 21st Century developments in this area largely ignored. It is as if Rodriquez began this book in the late 1990’s, got sidetracked, and then returned to his theme without updating his research. But the book’s failure to speak to contemporary immigration and Mexican-American issues does not detract from its historical analysis. And Rodriquez often offers a controversial perspective that reflects the author’s willingness to address uncomfortable truths. For example, Rodriquez notes the “conflict of visions” between MALDEF’s litigation on behalf of greater bilingual education and its advocacy to eliminate segregated schools. This is because increased bilingual education would necessarily “segregate” native Spanish speakers. Similarly, Rodriquez frequently notes the sharp contrast between how academics and activists frame the Mexican-American agenda as opposed to what polling data says about this group. He argues that while the former highlights the community’s status as “victims,” the latter reflects a community that is making great strides toward the middle-class. He notes how the poverty status of recent immigrants conceals and distorts the educational and income progress among second and third-generation Mexican-Americans, a skewing of data that he sees as serving the political agenda of both left and right. While Rodriquez’ analysis is not always “progressive,” anyone reading this book will learn that anti-Mexican American racism is nothing new in the United States, and that the so-called Prop 187 “backlash” in California simply reflected decades of ongoing racial hostility. He shows how the creation of Jim Crow in the 1990’s had devastating consequences for Mexican-Americans in Texas, who did not see themselves as a separate race from whites and now were being associated with blacks. Rodriquez’s chief point is that Mexicans are a racial synthesis, a mestizaje, that dates back to the time of Cortez. Mexican-Americans do not fit America’s desire for strict racial categories, and Rodriquez sees their rising number as ultimately blurring and upsetting longstanding views about racial identity. This point is what makes the book’s ignoring of the rise of the immigrant rights movement, and resulting backlash, so frustrating. Because Mexican-American voting patterns in 2006 showed that race rather than class was a dominant motivator, and that, contrary to Rodriquez’s belief, attitudes toward immigration are more ethnically based than ever. So while Rodriquez is correct that neither Latinos nor Mexican-Americans are a monolith, either in their racial background or social attitudes, the fact is that in 2007 millions of whites continue to see them that way. I have no idea why a book published in the fall of 2007 does not address critical issues impacting Mexican-American racial identity that emerged with the Sensenbrenner bill in 2005 and the massive immigrant rights marches in 2006. Rodriquez’s analysis of these more recent events would be great to know, but it is not in the book. Rodriquez’s book succeeds as history, but fails as a guide to understanding Mexican-Americans post-HR 4437 political and cultural landscape.